A concert program of art masters of Uzbekistan and Turkmenistan was presented at Khorezm Regional Drama Theater in the city of Urgench. 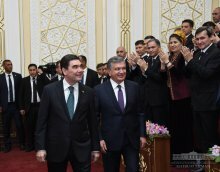 Presidents Shavkat Mirziyoyev and Gurbanguly Berdimuhamedov took part in the concert. The concert became another confirmation of friendship between Uzbekistan and Turkmenistan people, provided opportunities for wide acquaintance with modern and classical art of the two countries. Thereupon, the visit of the President of Turkmenistan Gurbanguly Berdimuhamedov to Uzbekistan ended. The President of Uzbekistan has seen off the President of Turkmenistan at Urgench International Airport.